China needs to develop its wastewater sector to tackle worsening water pollution. Efforts to improve wastewater treatment infrastructure are obvious: investment in wastewater treatment stood at RMB14 billion in 20121 and under the 12th Five-Year Plan (12FYP), total investment in wastewater treatment and recycling infrastructure in urban areas is expected to reach RMB430 billion, a 20% increase from the previous FYP. Despite these efforts, significant investment is needed to increase treatment rates to reach the target build-out of wastewater treatment plants (WWTPs) for nearly 300 cities in China which currently do not have such facilities by 2015. With the largest population in the world, China is easily the top ranked country by the amount of wastewater produced. In 2012, the total discharge of wastewater in the country amounted to 68.5 billion tonnes which is in volume terms comparable to the annual flow of the Yellow River of 58 billion m3 per annum. Discharged wastewater comprises of discharge from domestic use (e.g. human waste, washing water, urban runoff) and industrial wastewater. These are often labelled “point-source pollution” as there are specific points where the wastewater is discharged. Contrary to point-source wastewater, nonpoint-source wastewater comes from diffused sources such as agriculture, land runoff, precipitation, drainage and seepage, etc. China’s wastewater pipe network totals more than 414,000 km in length2, equivalent to more than 10x the Earth’s Equator at 40,075 km. It is quality and not quantity that the pipe network is lacking. Unlike the water supply sector with better established pipes, the wastewater infrastructure is less developed due to lagging construction of wastewater and sewage pipelines3. Not surprising, expansion of the wastewater pipe network is on the cards as per the 12FYP. 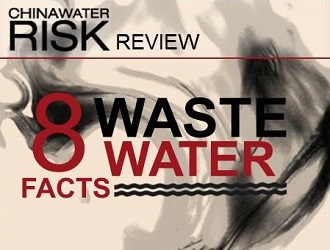 Last year, the Beijing Municipal government led the way and announced its plans to build 1,121 km of wastewater pipelines (see our review here). Given rising urbanization rates in China, it is important for the government to get municipal wastewater treatment right. The graph also clearly shows that the growth in domestic wastewater discharge has outpaced the growth in industrial wastewater discharge. 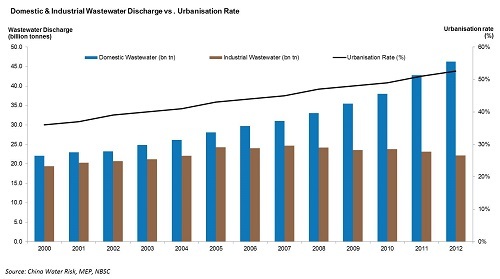 By 2012 domestic wastewater discharge accounted for around 68% of the total wastewater discharge. 4. 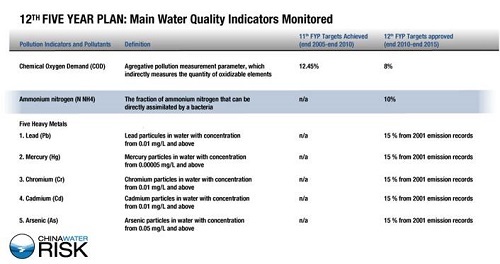 Industrial wastewater discharge appears to be under-reported! 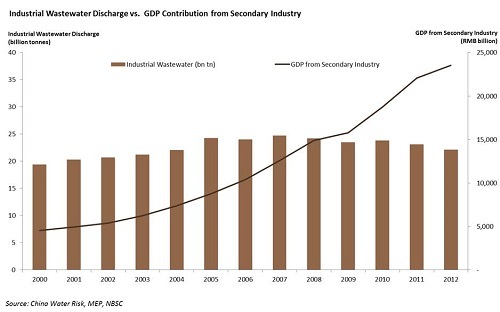 Industrial water has been falling since 2008 despite rising contribution by industry to China’s GDP which points towards the fact that industrial water is likely under-reported (see graph). Also, low official records of industrial wastewater discharge could be due to the current mismatch in the environmental water quality standards and the wastewater discharge standards. Please see Professor Ma Zhong, the Dean of the Environmental School at Renmin University’s in-depth views on industrial wastewater standards and pricing here. Heavy metal pollution is primarily from industry (although some are from run-offs from landfill and agriculture); whilst agriculture accounts for the largest portion of COD and NH4 emissions. Last year, the government officially linked heavy metal pollution to cancer villages (more on this here). Some standards are even more stringent than the ones in developed countries, whereas some high polluting industries have yet to establish their industry-specific discharge standards. Some regions have also established their own local discharge standards for water pollutants (e.g. Beijing, Guangdong and Liaoning), or special discharge limits to water pollutants in certain environmentally sensitive water bodies such as the troubled Lake Tai Basin. Agricultural water pollution in rural areas is compounded by low treatment rates of wastewater domestic households. Rural wastewater infrastructure is even more underdeveloped than their urban counterparts and access to centralized wastewater treatment is mostly unavailable. A World Bank study shows that rural wastewater treatment rate is far behind that of urban wastewater treatment, and that typically wastewater is simply dumped into farmland and rivers. According to local news, the current rural treatment rate is reported to be as low as 6%4, while the rate in urban areas is 77.5% for cities. As per the 12FYP, the wastewater treatment rate is expected to reach 85% for cities, 70% for counties and 30% for townships. In addition, as Premier Li Keqiang said on 5 March 2014, the government will also “solve the safe drinking water issue for more than 63 million people in rural areas”. ….solve the safe drinking water issue for more than 63 million people in rural areas. A particular treatment technology is chosen depending on wastewater composition, affordability and other factors. For example, OD is resistant to shock loadings and excess sludge production, AAO and AO are a technology of choice for high performance of nutrient removal whereas SBR is preferred for the treatment of domestic wastewater in rural areas and wastewater from industrial enterprises. Another issue is sludge disposal. Most municipal WWTPs don’t have excess sludge stabilization systems. The excess sludge is only treated through dewatering and/or thickening and is mainly disposed in landfills. Only a small portion of WWTPs actually reuse sludge in agriculture and other industries6 (read our review on sludge here). If wastewater discharge standards are tightened and wastewater treatment and discharge fees are raised, then more advanced wastewater treatment technologies (e.g. membrane reverse osmosis application to industrial wastewater reused onsite) and possibly for the very costly zero liquid discharge (ZLD) systems for industrial wastewater sector will become economically viable. 8. More waste & cheaper to pollute = time for regulatory reform? As of 2012, there are 3,836 wastewater treatment facilities in urban areas with a total operational capacity of 0.149 billion m3/day7. This is a vast improvement over the last three decades when wastewater was just dumped back into nature untreated – in 1980, there were only about 20 small capacity wastewater treatment facilities in China8. Treatment rates improved dramatically and have reached 77.5% in the cities, 60.1% for counties to < 20% for townships by the end of 2010. 12FYP targets expect treatment rates to increase to 85% in urban areas, 70% for counties and 30% for townships by 2015. Although the wastewater treatment rate has been increasing, it is hard to tell the real treatment rate given the fact that some WWTPs do not fully operate or even do not operate at all after completion, and some also suffer from under-developed supporting infrastructure such as incomplete sewage pipelines. Some plants are simply not turned on as electricity costs are high. Under-utilisation has been officially recognized by some provinces which have targets for improving utilization rates of existing wastewater plants as well as building new ones. The stark truth is that it is cheaper to pollute than to clean up. This is a result of systemic issues in wastewater pricing and discharge standards. So despite a high number of recorded pollution violations (see our previous notice here), companies will still continue to pollute not only because the fines imposed for pollution are still relatively low, but because it is currently cheaper to discharge untreated wastewater than to install & use the wastewater treatment equipment. Inadequacies in industrial water pricing, inconsistencies in discharge and water quality standards as well as inefficient tariff collection system are all discussed at length with Professor Ma Zhong, the Dean of the Environmental School at Renmin University here. Inadequate wastewater pricing also means that some WWTPs are operating at a loss. In 2012, 25% of WWTPs operated at a financial loss and had to rely on government subsidies. Although, there has been recent announcements by the NDRC indicating guidance at a national level on tariff reforms of the Water Resource Fee including the implementation of tiered urban tariff systems, indication at a national level regarding wastewater treatment and/or discharge fees is yet to be seen – more on this in “War on Pollution”. There are clearly significant challenges ahead in wastewater pricing and discharge standards reform if the government is indeed serious about cleaning up water pollution. Indeed if wastewater pricing and standards were comprehensively revised, not only will the upside to the wastewater treatment sector be significant, China’s water quality will also materially improve. Watch this space! Fundamental Issues in Industrial Water – Professor Ma Zhong, dean of the School of Environment of Renmin University gives his in-depth views on the industrial wastewater standards & pricing. Is it cheaper to pollute than to treat? Environmental Law Amendment: 40 Year Set Back? Will the proposed amendment set back China’s environmental development by forty years? Or will it be shelved? Inna, originally from Buryatia, Russia, has a BA in Chinese and Burmese Philology and an MA in Chinese Philology from St. Petersburg State University. She is currently completing her Master’s research on Burmese at the University of Oxford, where she works for the university’s Project Southeast Asia as the Chief coordinator of the organising committee at the Oxford Southeast Asian Studies Symposium 2013 & the coordinator of the Roundtable on Burma at the Symposium. She also contributes to Global Water Intelligence where she has conducted research on water markets in China and Russia as well as China’s water strategy, policies and regulations, water sector financing, water tariffs & water in power. Her interests are water–related issues with focus on China & Southeast Asia . She is fluent in Chinese, Burmese, Russian (native) and English. MEP Reform: From Mountaintop to Ocean?